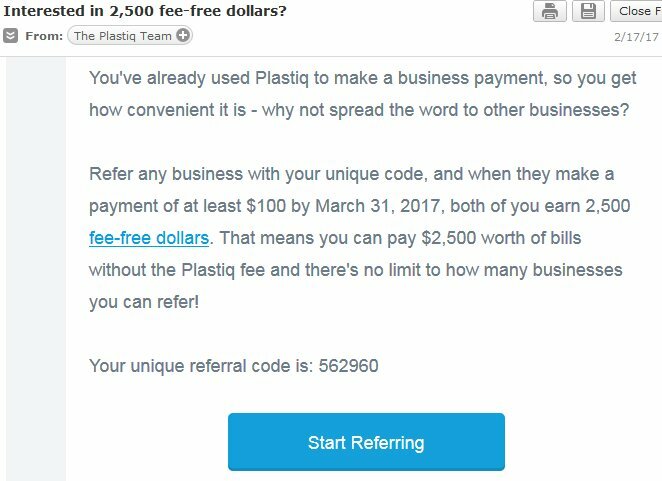 Plastiq has sent out emails to some of their users with a targeted increased referral offer that gives out $2,500 fee free dollars when you refer a new business. Refer any business with your unique code, and when they make a payment of at least $100 by March 31, 2017, both of you earn 2,500 fee-free dollars. That means you can pay $2,500 worth of bills without the Plastiq fee. Assuming you get at least 2% cashback, each referral should be worth $50 for both the referee and the referred business. And there’s no cap to how many businesses you can refer. I wasn’t targeted for this offer so I don’t have a referral link. If any readers were sent an email, please provide a referral code or link in the comments, and also post some kind of proof that you received the email. A link to a screenshot should be enough. For those looking to sign up for Plastiq through this promotion, make sure that the referral you’re using was targeted for this offer. If it wasn’t, you won’t receive $2,500 in fee-free spend, but only the standard offer of $200 in free spend. DoC readers have already posted tons of referrals. Used Julian’s link. Please use mine. Thanks! Remember to use your BUSINESS credit card to start with and set up a payment for at least $100. I also received the targeted email for this offer. My referral code is 562960. Thanks for using my link! I got targeted too! The email was like below. Thanks for using my referral code. You’ve already used Plastiq to make a business payment, so you get how convenient it is – why not spread the word to other businesses? These are the requirements from a convo I had with a Plastiq supervisor: users must sign up with your code, enter a business credit card for payments and make a payment with that card to earn the credits that will be manually applied within a business day.